Mikes Auto Repair Phoenix is your stop for quality solutions to your Starter Problems. In conjunction with Napa Brand auto parts, we provide only the best repair service and replacement options for your vehicle. The root of the starter engine is of course the ignition. When you turn your key it allows electricity to flow from the battery to the starter motor and complete the circuit for the first revolution of your engine. There are two devices which allow the ignition to fire and start the engine, the Starter Engine and the Solenoid. 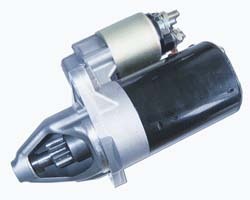 Because automobile manufactures deemed it more efficient, the solenoid is most commonly attached to the starter. These two devices in conjunction provide a jolt of electricity from your battery to make the engine to “turn over”. Furthermore, the starter also draws in a mixture of fuel and air to provide the initial explosion your engine requires in the beginning of its cycle. If your car tries to start, but can’t quite get the job done, it could possibly be the starter seeing some trouble. There are generally only a few things that can lead to a starter engine misbehaving. Malfunctioning Soleniod: Since the Solenoid and the starter work in conjunction to get the car started. If the solenoid is cracked or broken you cannot get the charge needed to begin running on gasoline. Bad Wiring: In order to take the charge from the battery, basic wiring is required. More than anything else, time and heat can take the worst toll on basic electrical components. A simple process of replacing some wiring can be all that’s required. There are also a few mechanical issues that can arise with a starter engine that would cause it to fail. The Flywheel, for example is made up of multiple interlocking “teeth” which moves the crankshaft and pistons. Over time the flywheel can degrade and cause the starter to cease functioning. Ultimately, because almost all of these components are inside a metal casing and are not meant to be serviced individually, it is best to replace the starter engine in its entirety. This ensures that your vehicle will start reliably for years to come. The process of troubleshooting a starter engine and solenoid combo can quickly become a tiresome task. Let us take away the stress of figuring out the problem and provide a quality service for your problem. Our mechanics are expert with discovering the issue and finding the best long term solution. Plus, we offer Free Towing to the shop for service. So if you can’t get your vehicle fired up, give us a ring and we’ll get you back on the road.